Almost every industry has seen a shift toward “green technology” or “eco-friendly materials.” While this is certainly a positive step for the earth, it can rightly be questioned whether the marketing that touts this particular aspect of the business is really effective. Does highlighting your green practices actually cause more people to buy from you? Does it have any impact at all? Does it, much to our shock and dismay, temper conversion? When we find an issue like this, we are inclined to run a test rather than trust our marketing intuition. 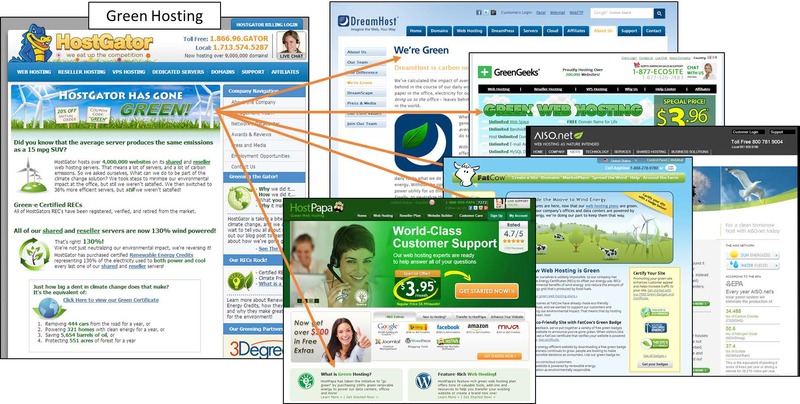 Experiment: Does green marketing impact conversion? The Research Partner for Test Protocol (TP) 11009 is a furniture company wanting to increase sales of its eco-friendly mattresses. Our key tracking metric was simple: purchases. 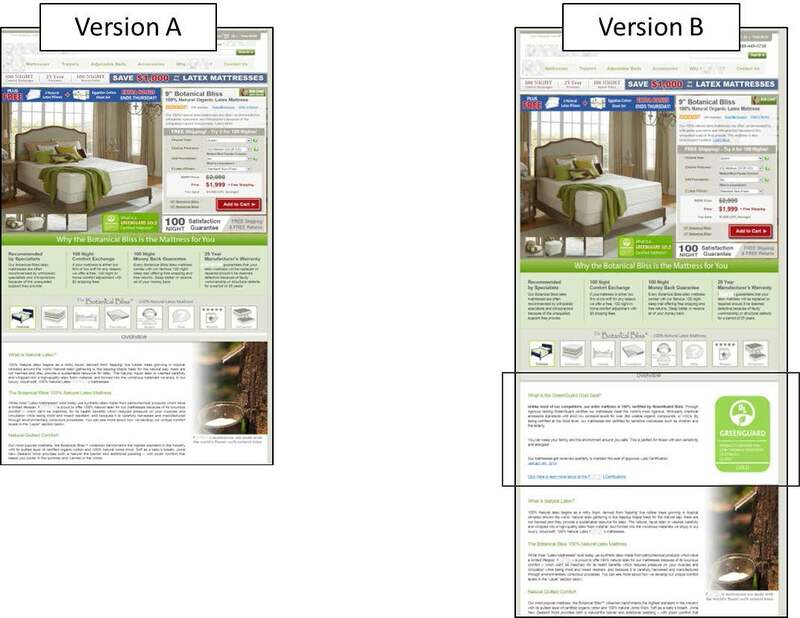 Our research question was this: Which landing page would create more mattress sales, A or B? As you can see in Figure 1.1, the pages were identical save for one key aspect: Version B included an extra section that Version A left out. In this section, we went into more detail about the green aspects of the mattress. It should be noted, however, that both pages included the “GreenGuard Gold Certification Seal,” so it is not as if Version A is devoid of the green marketing angle. Version B simply spelled it out more clearly. Did the change make a difference? Yes, Version B outperformed Version A by 46%. Remember, this lift is in purchases, not simply clickthrough. We have established that green marketing can be effective. But in what cases? How can we put that knowledge to good use and navigate the waters of green marketing with a repeatable methodology? In the test above, green marketing made a clear and significant difference. We made four observations as to why this particular green marketing strategy succeeded. You can use them as guides toward your own green marketing success. Key Observation #1. The value was tangible. The value created by the copy was directly connected to the customer experience. In the case of the GreenGuard Certified mattress, the value of being green was not solely based on its being eco-friendly. It also was customer-friendly. The green nature of the manufacturing process directly affected and increased the quality of the product. The copy stated that the mattress “meets the world’s most rigorous, third-party chemical emissions standards with strict low emission levels for over 360 volatile organic compounds.” Not only is it good for the earth, but it is also good for your toddler and your grandmother. When a hotel encourages you to reuse your towels to “save water,” it does nothing to improve the value of your experience with them. If anything, it may come off as an attempt to guilt the guest into reducing the hotel’s water bill. GE’s “Ecomagination” campaign is devoid of a tangible benefit to the customer. How does GE being green make my microwave better for me? The campaign doesn’t offer an answer. Conversely, “100% recycled toilet tissue” not only does not offer a tangible benefit to the customer, it also implies that the customer might not receive the same quality experience they would have with a non-green option. For green marketing to optimally operate, you must be able to a point out a tangible benefit to the customer, in addition to the earth-friendly nature of the product. Key Observation #2. The issue was relevant. The issue addressed by the copy dealt with a key concern already present in the mind of the prospect. For people in the market for a new mattress, especially those with young children, sensitive skin or allergies, there are well-founded concerns regarding the chemicals and other materials that go into the production of the mattress. This concern already exists in the mind of the customer. It does not need to be raised or hyped by the marketer. Again, not all green marketing campaigns address relevant concerns. People are more concerned with safety, comfort and affordability when traveling. Whether the airline is green or not is not generally a concern. When choosing a sunscreen, most people don’t go in with aspirations of choosing a green option. Their top concern is sun protection, and biodegradable sunscreen doesn’t appear to meet that need as well as another option can. Again, “biodegradable” is not a common concern brought to the table by people buying pens. Key Observation #3. The claim was unique. The claim of exclusivity in the copy intensified the “only” factor of the product itself. Just like any other benefit, green marketing benefits gain or lose value based on how many others can make the claim. If a web hosting platform touts itself as green or eco-friendly, the claim doesn’t hold as much force because the industry is saturated with green options (Figure 4.1). The same is true of BPA-free water bottles (Figure 4.2). However, in the case of our Research Partner, not many of its competitors could make the “GreenGuard Gold Certification” claim (Figure 4.3). This added exclusivity — not to mention that Gold status implied they achieved the highest level of certification. Uniqueness drives value up, as long as the benefit in question is actually in demand. Key Observation #4. The evidence was believable. The evidence provided in the copy lent instant credibility to any of the claims. After the initial wave of green marketing techniques and practices took the industry by storm, there was a very justified backlash against those simply trying to cash in on the trend. Lawsuits were filed against marketers exaggerating their green-ness, including the likes of SC Johnson, Fiji Water, Hyundai and others. As a result, consumers became wary of green claims and must be persuaded otherwise by believable data. The ability to prove that your green practices or eco-friendly products are truly as earth-friendly — and tangibly beneficial — as you claim is a crucial component in creating a green marketing angle that produces a significant increase in conversion. We have seen that green marketing can work. Still, this is not a recommendation to throw green marketing language into everything you put out. Green marketing is not a cure-all. However, given the right circumstances, the right green positioning can certainly achieve lifts, and we want you to be able to capitalize on that. Therefore, we have created this checklist to help you analyze and improve your green marketing tactics. ☐ Is your green marketing tangible? Does the nature of the green claims actually make the end product more appealing? ☐ Is your green marketing relevant? Does the fact that your offer is green solve an important problem in the mind of the customer? ☐ Is your green marketing unique? Can anyone else in your vertical make similar claims? If so, how do your claims stand apart? ☐ Is your green marketing believable? Are your claims actually true? If so, how can you quantify, verify or specify your particular claims? Of course, this checklist is only a starting point. Testing your results is the only true way to discover if your new green techniques are truly improving conversion. Interesting article. We really have not pushed the green aspect in our marketing campaigns. Since we are a foot care company, not sure how we would incorporate green into our advertising. Maybe, we could tell customers about our green efforts in the warehouse.